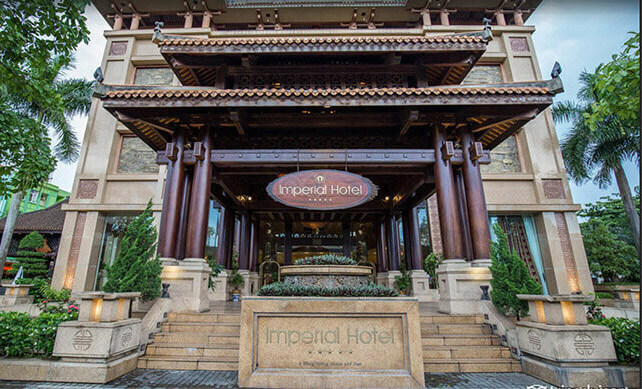 Imperial Hotel is the first five-star hotel in Hue, located on Hung Vuong boulevard in the heart of the city, abreast the Perfume river and only two-minute walk to Truong Tien bridge. It is in very close proximity to well-known tourist destinations of the world heritage city. 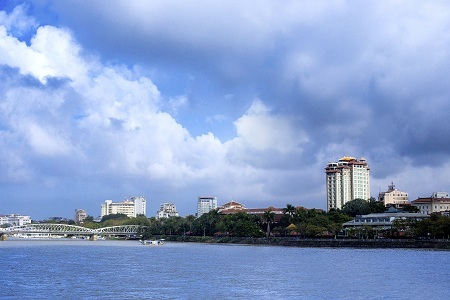 The hotel itself is a unique masterpiece in terms of high-rise architecture but bears the impression of the architectural schools of Eastern Asia, and of the Imperial City of Hue. The Imperial Hotel is the only place in Hue that the wish of leaving never comes when you get up in every morning, when you watch the sunset in every evening or when the night falls, because through your window is the charming Perfume river, and farther are the ancient works with the meditative style of the Imperial City of Hue. The King’s Panorama Bar occupies the top floor of the building. It serves some of the finest drinks in a very cozy atmosphere and has a long list of cocktails and wines for our guests to choose. The bar offers spectacular panoramic views of Hue City. Adjacent to this outlet is a large and spacious area where guests can have beautiful and unobstructed vistas of the city, river, island, mountain and historic monuments. 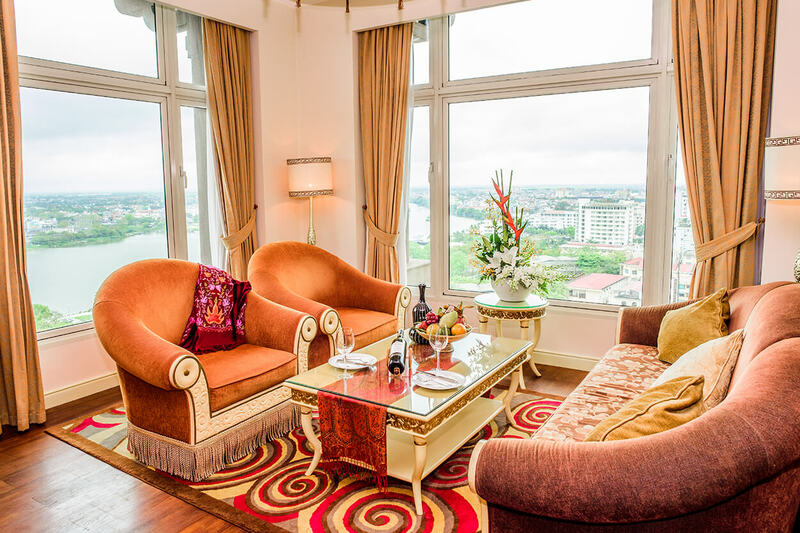 Located on the 16th floor, looking out over the Perfume River, V.I.P Starlight Lounge with its luxurious design, nutritious & fresh drinks and delicious dishes will bring you wonderful meals, unforgettable meetings with friends, or precious moments of relaxation. At this lounge, we serve European, Asian dishes and those from the 3 regions of Vietnam, specializing in the real cuisine of Hue’s royalty of the past. With a capacity of 400 seats, is magnificently and warmly decorated with wooden furniture in Eastern Asian style. It is the first Vietnamese restaurant having 4 kitchen viewing windows. Accordingly, your meals will become more appetizing and exciting with the pleasure of watching famed cooks performing culinary art. The outdoor garden of the restaurant, at a height of 22 meters, is a fascinating place for those who love a romantic and gentle atmosphere. The apartment is 58m2, which includes a living room, a bedroom, a kitchen, a bathroom and a store room between classic elements and modern amenities. The apartment is equipped with 02 LCD TV with cable TV, minibar, sofa, full furniture, household appliances and a washing machine. - Guest can settle the additional service expenses daily or together with apartment rental fee at the beginning of the month. Welcome to Imperial Casino Club, the 1st and only casino in Hue, players will have a chance to experience all the exciting slot games namely Jackpot Party’s multilevel progressive jackpot and many modern Cron machines. The club also features the latest state of the art multi-terminal roulettes, blackjack and baccarat games. Very high winning opportunities with big valuable prices, under European standard system. 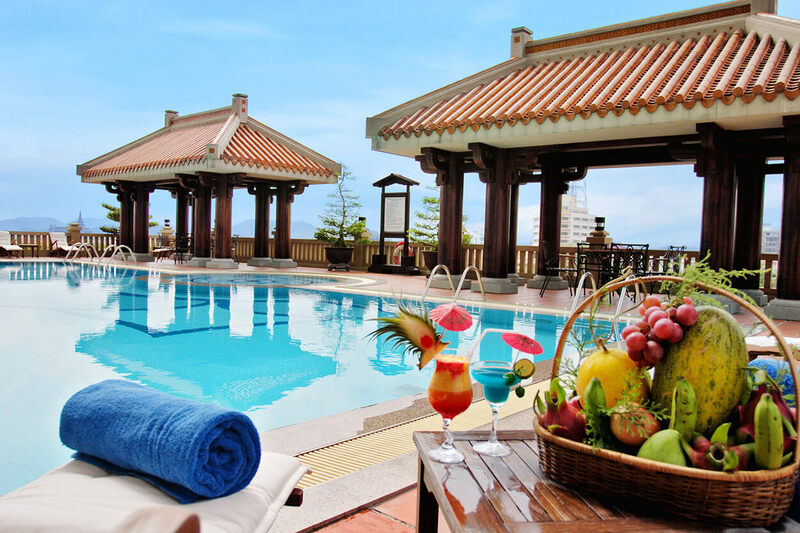 Moreover, there are many interesting and modern games and a full range of beverages and light meals are offered for free to help you have a comfortable and relaxing time at our Imperial Hotel. We ensure that your visit to Imperial Casino Club to be a memorable and exciting experience in Hue city.